Lets’ talk about painful trigger fingers. I have been seeing a lot of these in my surgical patients but in general as well from friends, family, and strangers. There is no real trend in how often or what time of year I tend to see this diagnosis. I do tend to see a trend when I have patients that wear those prefabricated splints for too long after surgery or from people that have a lot of swelling in their hands that linger. What is it? 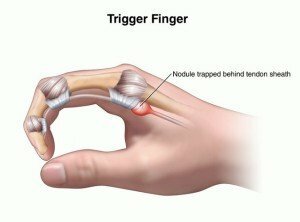 Trigger finger is essentially like having a knot along your tendon. See you have two tendons to each finger that help pull your fingers into a fist. Then you have these things called pulleys that hold those tendons down in the palm of your hand where your big knuckles bend. When you develop a knot along that tendon, every time you make a fist, that knot has to pass though that pulley system. When you open your fingers that knot gets stuck and now you have to sort of pop it out to straighten the finger. In the process of opening and closing your fingers, that knot which is “swelling”, gets even more swollen and irritated. Sometimes it can be the pulley system that gets thick making it hard for the tendon to pass freely. Both reasons can cause pain and is a vicious cycle. Left untreated, painful, and not using the hand will make it worst by causing stiffness in the fingers, weakness, and more pain. Not all trigger fingers are painful though. Sometimes it can be loud, hard, and the finger really gets stuck and the person has to manually use the other hand pull it straight but no pain at all. Funny how it works right? Oh if this happens to thumb, then it is called a trigger thumb. Now that you know what it is, everyone asks “why is it happening?” If only it was black and white….It’s not always clear why. It can be due to over use, repetitive use of the hand, or if you hit it on something hard. I have seen many patients that unfortunately developed it after surgery to the hand or wrist, and using a prefabricated splint that sits a little too high on the distal palmar crease or they have been wearing the splint longer then they need. The palm of their hand looks slightly swollen, the tendons there feel thick, and it’s painful to make a full fist. The ones I treat are painful trigger fingers. The mild cases that I give advice about are very mild – only asked because they found out I am a CHT. If it’s very mild, like the one my brother has (due to sustained gripping when he plays quadsport polo), I recommend massaging over that area that is painful or sore. Massaging with a block of ice as well in that same area is also helpful to reduce the triggering. And can you PLEASE stop opening and closing your hand repeatedly to show it off?? It makes it worst!! Steroid injections are a very effective treatment when the pain is moderate to severe. If injections are not an option that you want, therapy can be helpful to find where it is triggering and make a custom blocking orthosis (splint) to help reduce the symptoms. A consultation with your certified hand therapist can help you figure out what you need to do, teach you a home program, and also figure out what can be causing it in the first place so the right modifications can help reduce it from happening again. Sometimes, it is severe enough and surgery is something that you need to discuss with your hand surgeon. Hands on Therapy Services is a leading Miami certified hand therapist, specializing in painful trigger fingers, rehabilitation of shoulder, elbow, wrist, and hand injuries resulting from injuries, surgery, or naturally occurring conditions. Our Miami hand therapy services are provided by our certified hand therapist in Miami. We also offer occupational therapy in Miami with our on site occupational therapist. Plus – coming soon – we will be offering physical therapy in Miami.